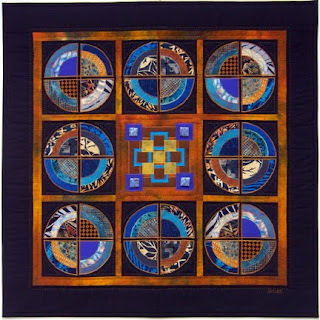 28" x 28" quilt is made of cotton fabrics, some of which are hand-dyed by the artist. The shapes have been fused and machine-appliqued. There are also hand embroidery stitches and polymer clay beads included in this striking design. Susan is a textile artist specializing in one-of-a-kind art quilts for the wall. 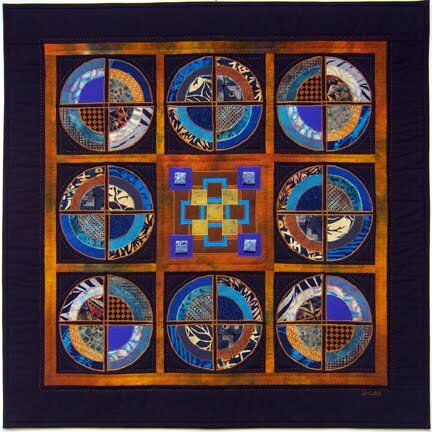 Many of the quilts incorporate hand-dyed, painted, or hand-printed fabrics, and are designed to be hung in residential or commercial settings. Susan has been creating fabric art since 1979, and has exhibited widely in the U.S. and also in 6 foreign countries. She teaches and lectures frequently about her work, and is represented in many museums, corporate collections, and university galleries.